The "European Over-the-top (OTT) Video Equipment Market Outlook, 2018" report has been added to ResearchAndMarkets.com's offering. 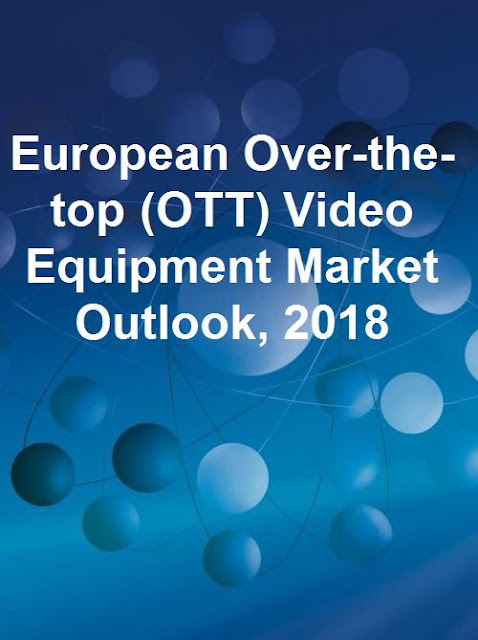 The European Over-the-Top (OTT) Video equipment market outlook provides bold perspectives, trends, and predictions in the market for 2017 and 2018. The segments covered include Content Delivery Networks (CDN), Online Video Platform (OVP), Online Video Analytics (OVA), Online Video Advertising Platform (OVAP), and Video Transcoders. The analysis aims to capture the trends that shaped the market in 2017 and predictions for 2018. Highlights of growth opportunities that will be created by OTT Video across the various sectors. 2018 growth/revenue analysis for OTT Video equipment vendors. Market Measurements are analyzed for 2017 and 2018- European OTT video equipment market snapshot; 2017-2018 growth rate sector-wise. An extensive list of start-ups to watch out for in 2018 is discussed in detail. The base year for the study is 2017, with 2018 as forecast period. The OTT video equipment market is at the center of a continuing wave of innovation and disruption. OTT video service providers are seeking solutions that enable them to understand the consumer better, improve efficiency, and reduce cost. Europe, being a mature market for online video, provides equipment vendors with lot of growth opportunities. However, high population diversity in terms of age, religion, language, culture, ethnicity and so on coupled with a preference for local services keeps technology vendors on their toes to keep themselves differentiated. Technological innovations to support high resolution formats such as UHD/4K, cloud based services, new formats such as VR/AR, and Automation were the key focus areas for OTT video equipment vendors in 2017. What are the top predictions and key market trends that will drive the various sectors of the OTT Video equipment market in 2018? What will be their impacts? What will be the key growth opportunities and strategic imperatives for current and potential market participants in 2018? What is the total OTT video equipment market size in 2017, and how is it forecasted to grow in the year 2018? What are the key technologies transforming the OTT video equipment market? What will be their impact? Who are the key market share winners of the overall OTT video equipment market and each of the segments?